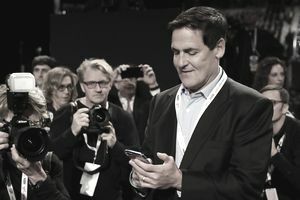 Mark Cuban's book How to Win at the Sport of Business: If I Can Do It, You Can Do It is a great addition to anyone's career library, whether you currently work in sports, aspire to work in the sports industry or are in any other career field. Simply put, the book is that good. Before covering the reasons you ought to read Cuban's book as soon as possible, a brief history of his career might be helpful for the uninitiated. The 58-year-old Cuban grew up in Pittsburgh, Pennsylvania and attended Indiana University. He subsequently made billions — with a "b" — selling his company broadcast.com in 1999 and then next bought the Dallas Mavericks from Ross Perot, Jr.
During his tenure as an NBA owner, he has clashed with the league on numerous issues and been known as an early technology adopter and had his team at the forefront of the analytics movement in basketball. With that brief background, on to the contents of the book itself. Begin by knowing that the book is short and informal in its tone and delivery. It is essentially a series of short blog posts, edited and sequenced for presentation as a book. This is not a criticism. In fact, for many readers, this format is an advantage. I have used the book in many college courses — both undergraduate and graduate — and readers consistently reported that this approach is a strength of the book. It feels like Cuban is sitting at a table (or bar) with you and telling the reader about his experiences and doling out personalized advice. The book follows Cuban's career arc and is full of interesting and insightful stories and advice. To get the full benefits of Cuban's views you, of course, have to buy and read the book. It may not be the sexiest advice, but in classroom discussions of the book this point always comes up.Early in his career part of Cuban's competitive advantage was his willingness to keep reading manuals. And we all know that manuals are generally not considered the most appealing reading. But he put in the time, did what no one else was interested in doing and it made him a knowledgeable person in his field. Simple, right? Another Cuban theme is about living inexpensively. In his view, once you start rewarding yourself with material goods — and the financial obligations that go along with them like a mortgage or car payment — you are hemming yourself in and limiting your future flexibility. This makes a lot of sense. Once you become too comfortable in your everyday life, the desire to succeed may be minimized, as you instead strive to maintain your lifestyle. Additionally, many great ideas come from people who are "hungry" for success and willing to do anything to make it happen. Why do you think companies like Apple and Facebook were started by twenty-somethings and not fifty-somethings? Another key theme in the book is advice on following Mark Cuban's path as an entrepreneur. There are many wonderful nuggets of advice passed along throughout the book on this topic, but one key one is the title of a chapter, The Best Equity Is Sweat Equity. In a Silicon Valley fueled world where companies are proud to trumpet the outside investments that are made in their firms as a signal of success, Cuban cautions that once you start taking money from investors and other sources, you become beholden to them. And those investors may want a seat at the decision-making table. And that you may even lose your seat at the firm's decision-making table. So his advice is to minimize expenses (similar to his personal advice covered above) and find the fastest road to profitability while at the same time keeping financial and decision-making control of your startup. Another chapter title that reels the reader in. One of the beneficial aspects of reading books like this one is when you come across counter-intuitive advice. Seemingly from the time, we can talk it is suggested to kids — quite consistently by their parents — that they should not whine. In a professional environment, that kind of behavior is also typically frowned upon. Yet, here is a successful American businessperson espousing that it is fine to whine. Why? You will have to read the book to find out his answer. The final of the chapter title themes to be presented here. This theme deals with failure, which is a popular topic in biographies and autobiographies. Nearly every successful person has to be resilient and bounce back from failures — which is what he means by "you only have to be right once." An important thing is to learn from past failures/mistakes. But another piece of advice is that you cannot allow your spirit to be crushed by a mistake or failure. One of the stories Cuban tells is about a significant amount of money that he loses because of employee theft early in his career. In total this book is only 84 pages of reading goodness. But as (I hope) this review has pointed out, it is packed with information and anecdotes that make the reader think. Think about their own behaviors. Think about their career goals. Think about all the learning they have left to do. And it is certainly the kind of book you will want to keep on your Kindle or phone to read and reread for years to come. If you do not follow Mark Cuban on Twitter, you should. His handle is @mcuban. You can also follow his articles on LinkedIn. Are You Ready for a Graduate Program in Sports Management? What Are the Careers in Sports Broadcasting? Can a Degree Help You Start a Sports Career?